(Nanowerk News) Fermions are the building blocks of matter, interacting in a multitude of permutations to give rise to the elements of the periodic table. Without fermions, the physical world would not exist. But atoms are extremely sensitive to light: When a single photon hits an atom, it can knock the particle out of place -- an effect that has made imaging individual fermionic atoms devilishly hard. The new imaging technique uses two laser beams trained on a cloud of fermionic atoms in an optical lattice. The two beams, each of a different wavelength, cool the cloud, causing individual fermions to drop down an energy level, eventually bringing them to their lowest energy states -- cool and stable enough to stay in place. At the same time, each fermion releases light, which is captured by the microscope and used to image the fermion's exact position in the lattice -- to an accuracy better than the wavelength of light. "That means I know where they are, and I can maybe move them around with a little tweezer to any location, and arrange them in any pattern I'd like," Zwierlein says. Zwierlein and his colleagues, including first author and graduate student Lawrence Cheuk, have published their results today in the journal Physical Review Letters ("Quantum-Gas Microscope for Fermionic Atoms"). For the past two decades, experimental physicists have studied ultracold atomic gases of the two classes of particles: fermions and bosons -- particles such as photons that, unlike fermions, can occupy the same quantum state in limitless numbers. In 2009, physicist Marcus Greiner at Harvard University devised a microscope that successfully imaged individual bosons in a tightly spaced optical lattice. 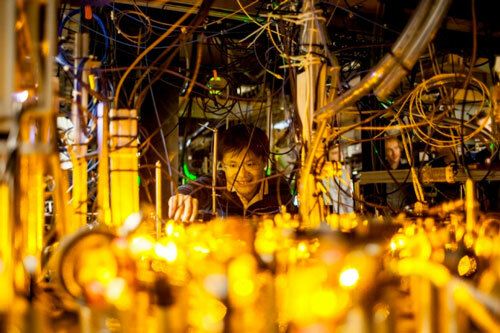 This milestone was followed, in 2010, by a second boson microscope, developed by Immanuel Bloch's group at the Max Planck Institute of Quantum Optics. "We wanted to do what these groups had done for bosons, but for fermions," Zwierlein says. "And it turned out it was much harder for fermions, because the atoms we use are not so easily cooled. So we had to find a new way to cool them while looking at them." Techniques to cool atoms ever closer to absolute zero have been devised in recent decades. Carl Wieman, Eric Cornell, and MIT's Wolfgang Ketterle were able to achieve Bose-Einstein condensation in 1995, a milestone for which they were awarded the 2001 Nobel Prize in physics. Other techniques include a process using lasers to cool atoms from 300 degrees Celsius to a few ten-thousandths of a degree above absolute zero. And yet, to see individual fermionic atoms, the particles need to be cooled further still. To do this, Zwierlein's group created an optical lattice using laser beams, forming a structure resembling an egg carton, each well of which could potentially trap a single fermion. 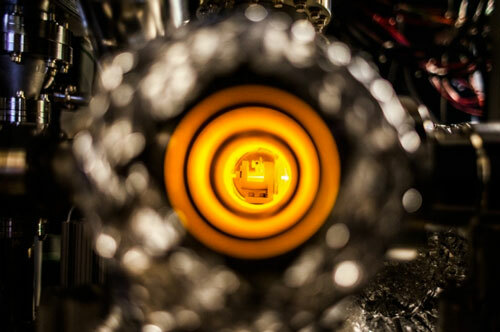 Through various stages of laser cooling, magnetic trapping, and further evaporative cooling of the gas, the atoms were prepared at temperatures just above absolute zero -- cold enough for individual fermions to settle onto the underlying optical lattice. The team placed the lattice a mere 7 microns from an imaging lens, through which they hoped to see individual fermions. "We needed a clever technique to keep the atoms cool while looking at them," Zwierlein says. His team decided to use a two-laser approach to further cool the atoms; the technique manipulates an atom's particular energy level, or vibrational energy. Each atom occupies a certain energy state -- the higher that state, the more active the particle is. The team shone two laser beams of differing frequencies at the lattice. The difference in frequencies corresponded to the energy between a fermion's energy levels. As a result, when both beams were directed at a fermion, the particle would absorb the smaller frequency, and emit a photon from the larger-frequency beam, in turn dropping one energy level to a cooler, more inert state. The lens above the lattice collects the emitted photon, recording its precise position, and that of the fermion. 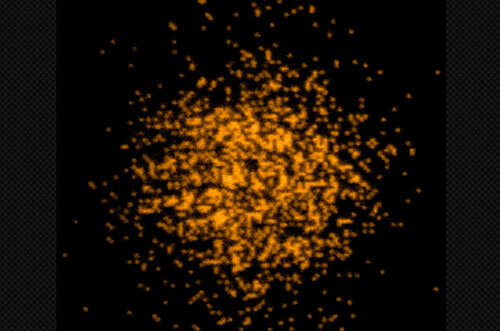 Zwierlein says such high-resolution imaging of more than 1,000 fermionic atoms simultaneously would enhance our understanding of the behavior of other fermions in nature -- particularly the behavior of electrons. This knowledge may one day advance our understanding of high-temperature superconductors, which enable lossless energy transport, as well as quantum systems such as solid-state systems or nuclear matter. "The Fermi gas microscope, together with the ability to position atoms at will, might be an important step toward the realization of a quantum computer based on fermions," Zwierlein says. "One would thus harness the power of the very same intricate quantum rules that so far hamper our understanding of electronic systems."